Neptune's moon Triton has always been a bit of a mystery, because it is in a 'retrograde orbit', that means it goes around Neptune 'backwards' compared to most moons in the solar system. A team of astronomers has recently published a theory to explain why. The team believe that Triton was caputured by Neptune during a three body encounter in the early history of the solar system. They think Triton was actualy part of a binary planet system, very similar to the current Pluto-Charon system, which had a close encounter with Neptune. 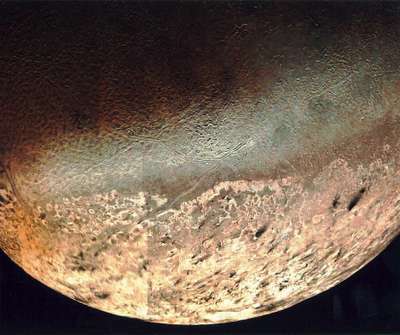 It's worth remembering that Triton is 40% bigger than Pluto, and has active geysers on it's surface. More technical details at Planetary Society's Blog. News has been pretty thin on the ground for the last week or so. I hope some of you have managed to find the Comet 73P/Schwassman-Wachmann 3 over the last few days, although the weather has not been ideal.